Mango recipes are endless and here's another one for this season.! This healthy yogurt granola parfait is best way to start your breakfast with and often contains some of breakfast's major staples. It's nothing but a layer of yogurt and your favorite fruits layered with granola/ muesli and is ready in minutes. When served in individual glasses they look so pretty and inviting. It's quite filling and something different to try from the regular oats porridge. The variations are endless and you can use any seasonal fruits as toppings. 1. If using home yogurt, hung the curd for 1 hr undisturbed. You can make if flavored by adding puree of your favorite fruit like strawberry or mango and mix it with curd. Add powdered sugar and mix it. Home made flavored yogurt is ready for assembling. 2. For assembling: Take a glass and spoon little yogurt for the first layer, then muesli, chopped nuts and honey and spread some chopped mangoes. 3. 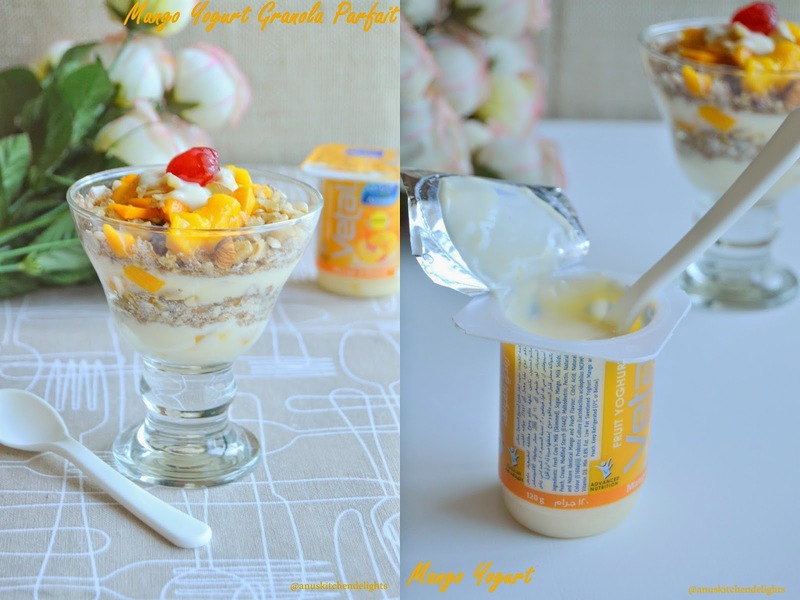 Again fill the yogurt mixture and continue the same process and finish it with chopped mangoes. Serve immediately. Chilled yogurt and a bite of crispy crunchy muesli with the sweetness of fruits simply tasted delight. You can also serve as a dessert after a meal and please your family. The addition to this recipe is endless and play with your creativity. You can mix a tbsp of cream with yogurt to make it even more richer. Top with your favorite jam and finish off. See that, once arranged to serve immediately as the granola/muesli should be crisp. quick and healthy parfait ! Looks really delicious! Would love to have some! yummy n i love to taste it nw.